How much of a good thing is too much? In this case, 16 cups per day. In May 2014, a 56-year-old man arrived in the emergency department at the veterans' hospital in Little Rock, Arkansas. He reported intense but vague symptoms: weakness, fatigue, and body aches. The emergency-room team drew some of his blood and found it bursting with a waste chemical called creatinine—more than four times the normal level. That meant he was experiencing severe kidney failure. Doctors started urgent dialysis, cycling the blood out of the man's body, through a machine that cleaned it in lieu of functional kidneys. The University of Arkansas physicians who managed the case were perplexed, they report in the current issue of The New England Journal of Medicine. What causes an otherwise healthy person to develop such dramatic renal failure? 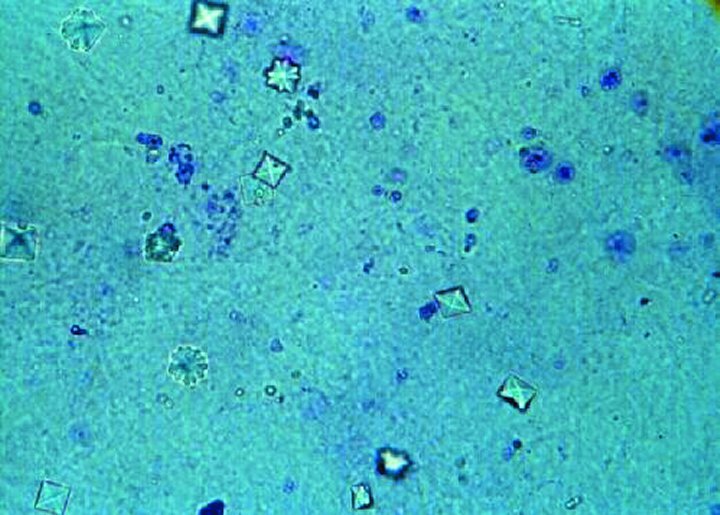 Another clue initially confused the picture: Urine tests found oxalate crystals at more than twice the upper limit of normal. When they show up in those quantities, doctors are taught to ask if the person has been drinking antifreeze, because ethylene glycol can cause oxalate crystals to accumulate. This man denied drinking antifreeze—as people who drink antifreeze tend to do. But the doctors didn't need to pursue that line because, they report, "on further questioning, the patient admitted to drinking 16 eight-ounce glasses of iced tea daily." And then it made sense. The man had been brewing the tea at home, and luckily, despite the Southern tradition, it was unsweetened. Black tea constitutes upwards of 80 percent of the tea consumed in the United States, and it is high in oxalate, a chemical that is a metabolic byproduct in many plants. If a person is eating a lot of those plants, regardless of said person's relationship to antifreeze, oxalate can build up in the kidneys and lead to renal failure. In this case, the doctors did a biopsy of the man's kidneys and found oxalate throughout the renal tissue. "That's what we think was the cause of his kidney failure," nephrologist Umbar Ghaffar said in a local television interview. She and her colleagues extrapolate in the New England Journal, "Oxalate nephropathy may be an underrecognized cause of renal failure," implying that people might be more vigilant in monitoring their oxalate intake. Or, at least, avoiding extremes. Other kidney specialists agree. “I wouldn't tell people to stop drinking tea,” nephrologist Randy Luciano of the Yale School of Medicine told the Associated Press, attributing the man's renal failure to the fact that his intake constituted "a lot of tea." "Two to three glasses [of tea] would be considered safe if you are not eating other oxalates," the UCLA nephrologist Ramya Malchira told Medline Plus. "However, if someone were also eating high quantities of high-oxalate foods such as spinach, even two or three glasses could be too much." I like this case as a reminder of the misguidedness of consumptive extremes, even of something so healthy as tea. People have developed kidney failure from oxalate-rich foods including rhubarb, peanuts, star fruit, and wheat bran. The complication is extremely rare, and can in no way be taken to mean that these foods are categorically unsafe. A rare point of unanimity among nutritionists is that fruits and vegetables are the foundation of healthy diets, even though blueberries, blackberries, and raspberries are high in oxalate and could theoretically cause kidney failure at exorbitant doses. This is a time of binges and cleanses, all-or-nothing good-or-bad dichotomies in nutrients and food. No saturated fat, or all the saturated fat I want? Eliminate gluten because some people have celiac disease? Avoid a preservative because it can be toxic at extremely high doses? Just because a little bit of something is good doesn't mean a lot is good; just because a lot is bad doesn't mean a little is bad. Vitamin C breaks down to form oxalate in the body, and it has been found to cause oxalate nephropathy at high doses. Of course, without vitamin C, you get scurvy and bleed from your eyes. Hopefully the idea that tea and spinach could kill us, too, is only liberating.